Summary 0008250: Military dwarves won't attack goblins 99% of the time, and when they do they cause a loyalty cascade. Description I have observed multiple instances where my military dwarves will not fight any enemy like goblins, werebeasts, etc. They will obey move commands, but will not fight enemies that are within view and obviously engaging them in combat. When given a kill command they will move to the location of the target but again just stand there while the goblins attack them. They will dodge and block incoming attacks, but not fight back in any manner. Sometimes repeated cancellation and re-issuing of orders will get them to attack a few of the goblins, but once that happens they initiate a loyalty cascade throughout the fort and everything goes to bedlam. Steps To Reproduce Have a goblin siege attack the fortress, send military dwarves to fight the goblins. Additional Information This issue seems to happen a lot more with melee dwarves than marksdwarves. has duplicate 0008408 resolved Footkerchief Marksdwarf friendly fire. Intentional??? has duplicate 0008165 resolved Loci Soldiers ignoring enemies. related to 0008336 acknowledged Knight Otu Military dwarves frozen in place after carrying out a kill order. related to 0008364 resolved lethosor Dwarves stop fighting after some times. related to 0008367 resolved Toady One Soldiers not attack nearby enemy when using kill or station order. Have had same issue on my desktop PC, also running windows 7. This time it's a werelemur that they will all stand around and watch while it mauls my militia commander. Did the enemies dodge into or fall through empty space? When you issue a kill command, does the jobs screen show "(no reachable valid target)" for your soldiers? Please upload a save that demonstrates the problem to http://dffd.wimbli.com/ [^] and post the link here. Here is a link for a save where the bug is currently happening. The linked save file should be attacked by a goblin siege very soon. If you issue any sort of move or kill command to the three military squads they should move to the indicated location and then stand around not attacking the goblins/enemies while being attacked themselves. This is the first time I've uploaded a save, so if I made an error uploading please let me know. This is another save file in which the military dwarves will not attack enemies. In this case, there is a cyclops actively engaged in mauling my civilians. The military dwarves will just stand around watching, no matter how often I issue any type of order, cancel and reissue orders, activate/inactivate the squad, etc. The only dwarves actually fighting the cyclops are some civilians he has attacked. Also see 0008288 and 0008331. I just got this problem (for the fifth time now) and I realized something strange: It seems speardwarves and markdwarves aren't affected but instead quite slow to react to orders. Can someone else can confirm this? More werebeast combat wierdness. I've not had the problem with goblins but last 2 worlds and forts(saves uploaded) werebeasts are unattackable in beast form but then get killed after transforming (if they don't run off the map first). Reproducibility has been always on these 2 saves. I have the same bug happening here as well, world save linked. It's really annoying. Entire squads will just stand around and defend until they are inevitably hit. But it's weird, it's not always the case. Here's a save, with the issue happening in .40.14. Stationing close to the minotaur (on the surface, to the left) leads to the soldiers having no plan, giving an attack command leads to 'no valid reachable target'. I too have had the issue happen in .40.18 and .40.19, two separate instances. In the .40.18 game, a Cyclops meandered into my fortress and began murdering my livestock and hunters aboveground, so I sent out a squadron of Danger-room trained legendary soldiers. They then proceeded to walk around the Cyclops, actively dodging his attacks but not fighting or counterattacking in any way. They even watched the Cyclops murder a total of 15 random Urist McWimps, and stood around just dodging. I eventually put everyone underground and when the Merchants arrived a year later, their soldiers killed him. I noticed in the Report Log, my soldiers just stood around saying things like "I am attacked! I will have my revenge!" 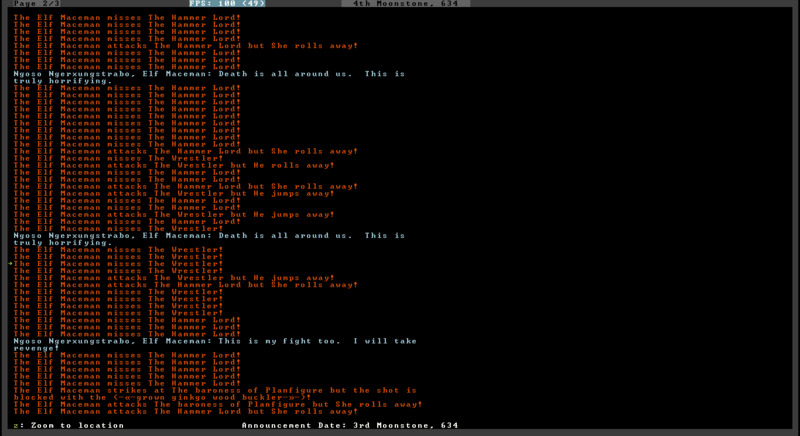 In 40.19, a group of 9 Troglodytes came from the caverns and started attacking my Urist McWimps, so I sent out the legendaries again, and they just stood around. I sent War Dogs, and they fought at first, but eventually they just started standing around too. After about 4 months of just standing around and watching my Dwarves die I just gave up. I too was getting the "No valid reachable target"
Fixed a large cause of this. Feel free to reopen with saves if they don't work in 0.40.24+.